We strive to provide the most professional, honest, opinions and information available for all of our fellow bass players; offering our customers quality instruments, amplifiers, and accessories at the best possible prices. 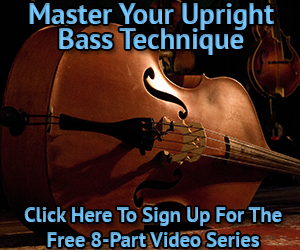 It is our intention to become a bassist resource site that provides current and usable information for all players, no matter whether they are a beginner or professional. Although we may not carry a large inventory, we are intimately familiar with all the equipment either, having owned or played. If you will allow us the time to ship you the instrument of your choice, we can assure that you will not only be pleased with the quality, but the price and shipping as well. One thing can be assured; that we are not – a peddler of junk. We won’t play it nor will Bass Clef Shed carry it. This site and business is developed for the love of the instrument and the excitement and joy it brings to me personally . . . and all of you. I (Joseph Batitto) have been a bass player since 1969 when I picked up my first Kent Bass and Ampeg Porta flex 12” and began taking lessons; then in 1975 found a 1948 Kay M1. I grew up in a family of musicians and when I witnessed the joy that music brought to them I was hooked. By the age of 17, I was hanging in Jazz clubs in NYC, studying with Richard Davis, Victor Gaskins and Cecil McBee; although still woodshedding on my electric bass, while listening to the electric players and upright players on vinyl. Those players included Bootsy, Larry Graham, Jaco and Stanley Clarke, Paul Chambers, Gene Perla, Buster Williams … the list goes on. I have always been interested in the equipment aspect of playing and dreamed of one day being able to be involved in offering great equipment and set ups to fellow players without feeling they have over paid; or just didn’t have any personal connection to the proprietor. I have created this site as a resource with the added bonus of offering fine instruments and accessories to bass players, from a bass player. In my sojourns I have met and befriended some very talented players that I have the honor of presenting in our Woodshed. They will provide videos, insights and articles relating to playing, care and instruction. This is more than a website, this will be the Woodshed to share and hopefully learn. I am very excited to enter this new chapter in my life as a bassist and to share my website and its offerings with bassists of every age. 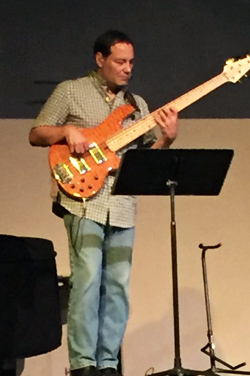 I owe my inspiration to others that have pioneered this realm before me and want to give them mention: Bob Gollihur; after speaking to Bob almost two decades ago, my thought was to one day be a resource and influence to other bass players as he was to me. 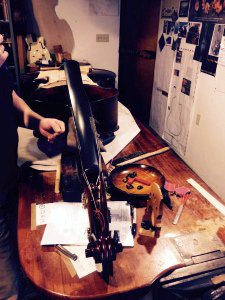 I have studied with the incredible Luthier, James Condino, out of Asheville, NC to learn the finer points of bass Luthier www.condino.com and am a current member of The Guild of American Luthiers.